"Turbulent were the times and fiery was the love story of Zhivago, his wife and the passionate, tender Lara." The 1965 epic Dr. Zhivago begins a couple of decades after the Russian Revolution, with Lieutenant Yevgraf Andreyevich Zhivago (Alec Guiness) searching for the child of his half-brother, Yuri Andreyevich Zhivago. Although not entirely certain, Yevgraf believes a blond-haired young woman named Tonya may be his niece. He proceeds to recount the story of his brother's life. After Yuri is orphaned as a young child, he is taken in by family friends Alexander (Ralph Richardson) and Anna (Siobhan Mckenna) Gromenko. The Gromenkos have a daughter, Tonya (Geraldine Chaplin), who grows up with Yuri. Under the Gromenkos charge, Yuri goes to medical school and becomes a doctor. Meanwhile, another Russian young woman, Lara (Julie Christie), has an affair with her mother's friend, Victor Ipolitovich Kamorovsky (Rod Steiger). Lara's mother commits suicide when the affair is discovered. Yuri, who is a doctor's assistant meets Lara when his is called in to tend to her mother. Lara marries Pavel Pavlovich (Tom Courtenay) and has a daughter, Katya, and Yuri marries Tonya and has a son, Sasha. When the war breaks out, Yuri becomes a military doctor. He and Lara meet again and begin an affair. He is discharged after several months and goes back home to his family. As the war rages on, Yuri is abducted by Communists to serve again as a military doctor. After Yuri's return, he discovers that Lara's husband has committed suicide while awaiting execution. His affair with Lara resumes after he discovers that his wife and son have immigrated to France. Realizing that Lara's life is in grave danger, Zhivago sends her away to the Far East. After many years, Zhivago spots Lara from a train and has a fatal heart attack while pursuing her. Lara informs Yefgraf after Yuri's funeral that she and Yuri had a daughter, but she was lost during the White government collapse in Mongolia. Back in the present day, Yevgraf tells Tonya that her mother either died in a labor camp or disappeared. Upon seeing Tonya with the balalaika, he realizes that Tonya must be his niece because Yuri's mother also left him with one when she died. 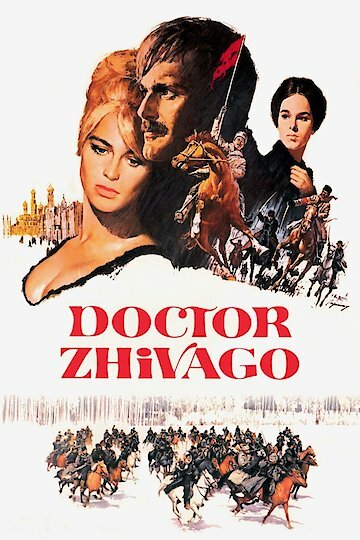 Doctor Zhivago is currently available to watch and stream, download, buy on demand at Netflix, Amazon, Vudu, Google Play, iTunes, YouTube VOD online.